Boris Johnson has said he will now back the prime minister’s deal, the BBC’s Laura Kuenssberg said. But the Democratic Unionist Party said they would not be dropping their opposition to it, party sources told the BBC’s Northern Ireland political editor Mark Devenport. “Prime ministers come and go” but the trade and constitutional issues affected by Mrs May’s withdrawal agreement would “live on”, DUP sources said. May did not name a departure date at a packed meeting of the 1922 committee of backbench Conservative MPs. But Laura Kuenssberg said a Tory leadership contest could be expected in May. Downing Street said it would be a “different ball game” if the deal was not passed by Parliament. It comes as MPs seize control of the Commons agenda to hold votes on alternatives to the deal. Mrs May told the 300 or so Tory MPs at the meeting “we need to get the deal through and deliver Brexit”. 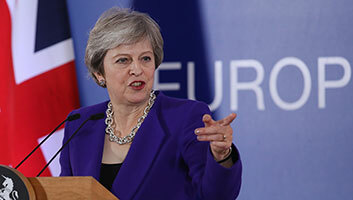 The BBC’s Iain Watson said a very senior Conservative had said the PM was “as clear as she has ever been” that she will not be around for the next stage of Brexit but if the deal does not pass then “that’s a different matter”. Iain Watson said Mr Johnson – who is likely to be a leadership contender – was smiling as he left the meeting. Labour leader Jeremy Corbyn tweeted that Mrs May’s announcement “shows once and for all that her chaotic Brexit negotiations have been about party management, not principles or the public interest”. George Freeman, the prime minister’s former policy adviser, said she had done the “right thing” in announcing her decision to stand down, even though it had been a “sad moment”. The Tory MP told BBC News her speech had been followed by a series of interventions from “very hardline Brexiteers” all saying “prime minister, thank you, I will now vote for this deal”.